Shane van Gisbergen says the Triple Eight cars are in a “special” place after another dominant showing of speed across the weekend at New Zealand. 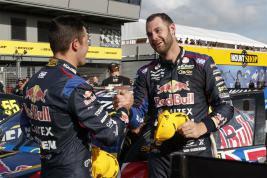 Between van Gisbergen and teammate Whincup, the Red Bull cars took three of the four wins!! Next race @ Sydney Olympic Park Street Circuit for the “Coates Hire Sydney 500” 02-04 December 2016.